Been wanting to add my two cents on Glossy Box for a while now. However, I only just got my first Glossy Box this month so I didnt talk too much on it beforehand. I was skeptical that they might be a one trick pony, and I think the second box fiasco probably was a bit of a step in the wrong direction for them, but I was still interested and wanted to get my hands on a box. I'd actually paid for my box way back in May but for some reason (thank the lord with hindsight!) it skipped last month and ended up getting the July box. For me this month is a big thumbs up! The contents do vary as some people also got Xen Tan stuff and some other things. However I'm satisfied with all my bits, nothing is stuff I wouldn't use or liked to have tried so there are no problems with that! 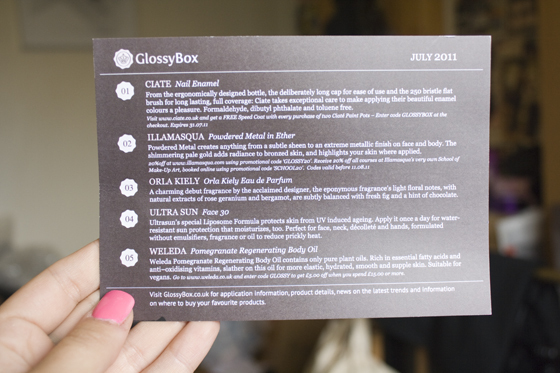 Would I recommend Glossy Box? Depends how you look at it. Fist box, good, second box meh, third box good. Yeah its a bit up and down, and the price is increasing to £12.95 but I personally would pay that. 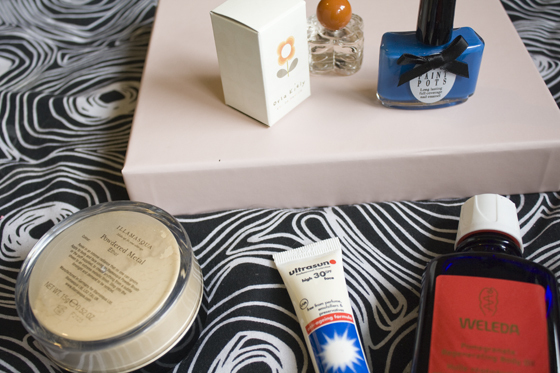 I like samples and trying new things, I don't generally buy alot of makeup or skincare apart from mascara and foundation so its nice to get some random bits each month. I think the price is good considering I know alot of people spend more than a tenner a month on products they dont like or simply just use once! I think people got a little OTT last month bashing the box, I did feel really sorry for them in the end as some people went as far to claim they were "on drugs" and how awful they were. I think OK they messed up, it was their second box though, I think with new companies, especially ones that are sending random samples paired with the fact I think everyone thought they were going to get a full sized Nars product didnt help. SAMPLES being the operative word, I do think they need to stop sending fullsize products out because its going to give people the wrong idea! Also add in their little price increase announcement faux pas, They ended up with a ton of bad press. I think people expected a little too much, but like the Birch Box & other US equivalents they seem to vary in quality too. In short I will continue to sub to Glossy Box in the future for sure. However I've ordered the Boudoir Prive box which I think comes in August, so we shall see how it compares! I totally agree, the price change was a bit of a surprise as we'd entered into an agreement but as long as the boxes are going to continue as they are I'm happy to pay that. TBH I spend so much on cosmetics that 10 or 12 pounds won't make a huge difference and at least i'm not left with massive sized bottles which I don't want. I did want the bright yellow nail polish though, but i'm glad to have got to try the xen tan! I cancelled mine after the last box, mainly because of the price increase. That is still a big turn off for me, but because of the great stuff you got in this box I'm upset I jumped the gun too soon! Also very excited for when my Boudoir Prive box arrives! I think I might sign up for next month. For £12.95 it's not bad! I'm sure I could find someone to have the products if I didn't like them too. These products look fab. Once I've got a steady income I'm definitely going to sign up! I still don't know. I think the improvement in the 3rd box was a reaction to the disappointment of the 2nd box. Just a marketing ploy to me. But that nail polish looks great! These products look fab. Can you make a video tuto make up? I got these exact items too! Very happy with my first box, and looking forward to the August one. This month's was my first box too. I was pleased with what I got (definitely worth the money) but I find it strange that they send out different items to different subscribers; I would have quite liked the perfume or the Xen Tan but got a lip gloss and sun tan lotion - you can't always get what you want though I suppose! I am also excited to see the Boudoir Prive box - the brands they're using for the first box are already on their website aren't they; I haven't heard of any of them but then I don't know a great deal about beauty/make-up. this box seems like heaven! P.S. I'm liking the new typeface for your titles :) (they're maybe not new as I've been MIA for a while). Hi Llymlrs! This is Veronica Cudjoe from Boudoir Privé. Thanks for mentioning us in your blog post! 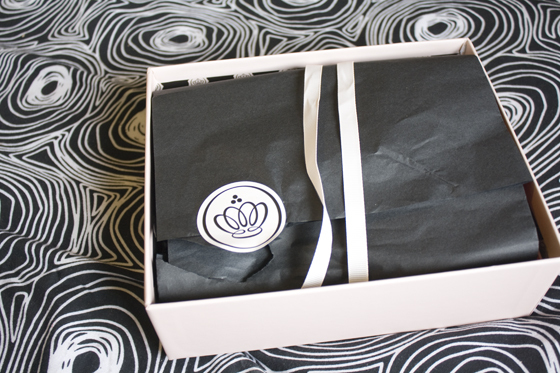 We can't wait for you to receive your Boudoir Beauty Box in the next couple of weeks and look forward to your review! Boudoir Privé is all about discovery. Every month our members discover exclusive, luxe brands from all over the world, some more famous then others. All have been hand-picked by our beauty experts for their top quality. So some brands you will know, others not. Our first limited-edition box has BABOR, BLOOM Teas, Etat Libre D'Orange, Jane Iredale, Olavie and SachaJuan! I'd never even heard of such boxes before this post, but shall definatley by signing up for the Boudoir Prive box. Mainly because i am in L.O.V.E. 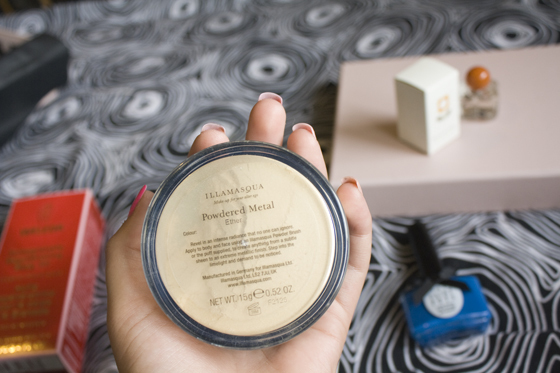 with Jane Iredale products, and getting my hands on more free samples would be a god send! They are all mineral and absolutely fab; they have healing properties like tea tree, give a great coverage and a dewy glow! The eyeshadows are a must too, ultra creamy and easy to blend! 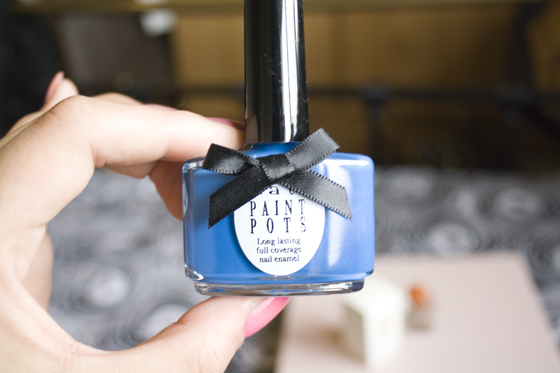 Soz for the ramble - just so excited at the thought of trying more without the pricey tag! You'll have to keep us posted on what you get. Keep up the amazing blogging. P.S. This has inspired me to do a post reviewing Jane Iredale shortly if anyone wants more info on this great range.